Luis Gono, the country’s first Toyota Vios Cup champion and ace drift racer racked up another milestone as he led his team to clinch the overall championship at the 2017 8 Oras ng Pilipinas endurance race held at the Clark International Speedway. Gono was part of the five-man Tuason Racing Team which competed in the 8-hour endurance race. Other members of the team were: Bjorn Ongtiaobok, Ferdie Ong, Louis Ramirez, and Mike Tuason. Running solo in the Formula category, Tuason Racing Team fielded in a Formula V1 car car. Equipped with a 1.5-liter Toyota engine, the purpose-built racer featured lightweight construction and unparalleled agility. “Our car was not designed for endurance racing and we even had to really push it every time we gassed up because our gas tank only had a 20-liter fuel capacity,” explained JP Tuason. Team manager Miguel Ramirez had to apply a strategy that would maximize fuel consumption with the most number of laps at the quickest time possible. “Since Luis Gono was the fastest among the team, we had to tweak the car to suit his driving. We strategically chose who would drive the car at this point of the race and in the end, it was the youngest who carried the team to the finish line,” added Ramirez. “ It was a learning experience for me and my body ached after the race because I drove for four hours,” says Gono. 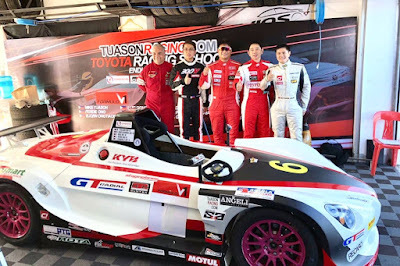 Despite having the one of the most underpowered car among the competing teams, the perseverance, experience, and sheer talent of the Team Tuason Racing helped them win.